The Super Wolf Blood Moon! Yes, I know this phrase is a media super hype, and actually I tweaked it just a little bit. Super Wolf… it’s a thing. Wolf Blood… it’s a thing too. Super Wolf Blood Moon, ahoooooo! I was sick and should have stayed home and went to bed… but what fun is that?!? Astrophotography is a compulsion, and the muse must be obeyed. This image is four frames stacked, each taken in rapid succession right after midnight. Hey, it’s the witching hour super wolf blood… okay, whatever. The exposures were with a Canon 5D Mark III DSLR on a Sky-Watcher Esprit 150 refractor (f/7). They were taken at ISO 3200 with an exposure time of 1.5 seconds. I found on the Moon just like for night scapes, higher ISO’s actually do have lower noise for low light images as long as you get sufficient light to the sensor. I wrote more about it over here at Sky & Telescope. The shorter ISO 100 images actually have significantly more noise. Another side note, I posted this same image on Facebook and Instragram and they both destroyed the lower portion of the image! Apparently, the JPEG compression just saw the faint details in the red as big blobs. I love how much detail I got out of this. 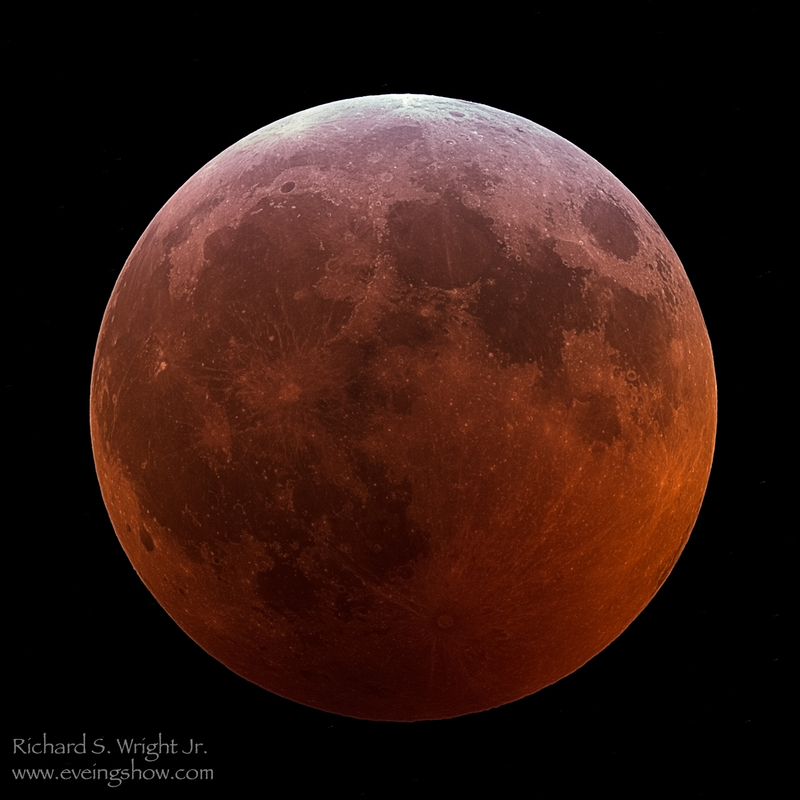 I know a lot of people are trying to do something really creative with a collection of images, else it’s just another eclipsed moon image, but still… this one is mine, and it’s just a well executed image with quite a bit of detail visible throughout.